Simple yet powerful features and functions increase efficiency of store management and improve productivity. The TE-2400 offers a large flat keyboard for quick and easy access to items assigned to the keys. An abundance of functionality for small to medium sized operations that include a guest check file, three (3) menu levels, detailed operator tracking, set menus, reporting strings and macro keys that link several key operations into one (1) key depression. Peripheral connectivity to the two (2) serial ports that includes remote printers, scale, remote customer display, liquor dispenser, scanner and electronic payment device. The electronic payment device interface with PAX includes credit, debit, EBT, gift, EMV and contactless functionality. Contact us http://www.casio4business.com/contact for more information regarding this low cost integrated payment solution for the TE-2400 and PAX payment device. Financial, Department, PLU, Clerk, Hourly, Mix and Match and Scanning Items are some of the reports available to owner/managers to analyze their business sales activities. The TE-2400 offer three (3) reporting periods that can be used for Daily, Monthly and Yearly reports. Two lines of main display with 14 segment alphanumeric display. Equipped standard with pop-up customer display. 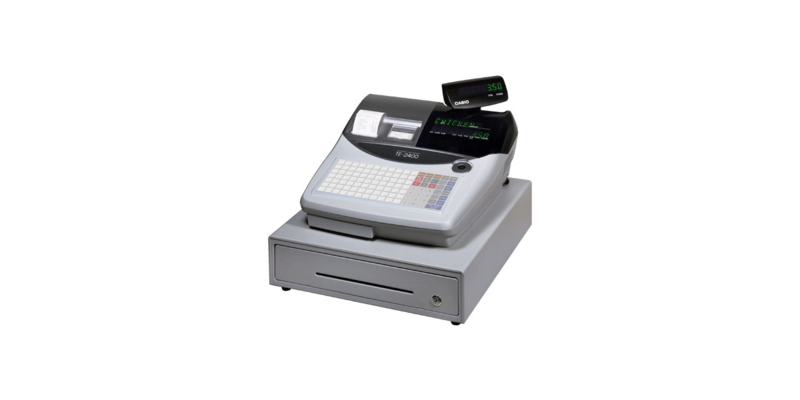 The TE2400 can scan up to 2,000 items (memory permitting) and provide inventory counters for these items. Scanning items can be added directly into the file through programming or during registration using the Not Found Item functionality. A CF (Compact Flash) card can be used as a storage device for sales data to create your reports with spreadsheet software to make creating sales reports much easier. A CF card can store program data for backup purposes as well. Two serial ports are available for direct connection to a PC, external remote printer, electronic payment device for credit/debit/gift/EBT and EMV transactions, scanner for barcode reading, or slip printer for printing guest reciepts or validation. Basic table control function is provided for small restaurants, cafes and bars. External printer can be configured for order or receipt printing.